Inspiration? 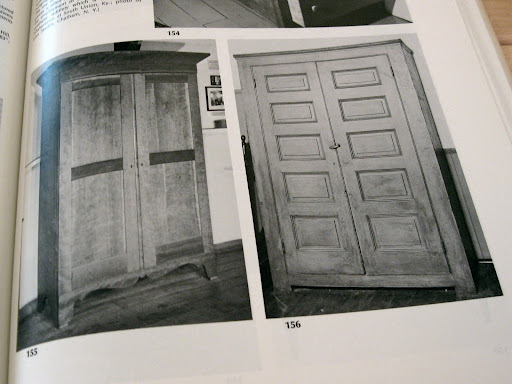 I turn to a photo filled book on Shaker furniture for design ideas. 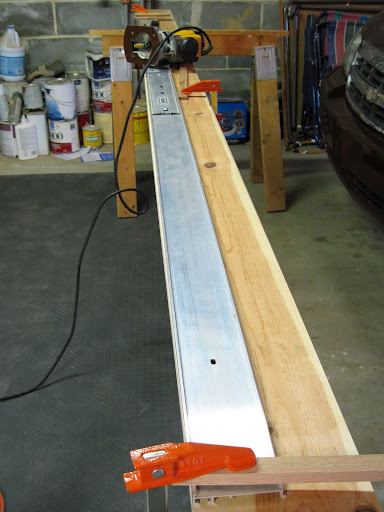 As the first phase of my crown molding project comes to a close (it officially has a first and second phase), I have been thinking more and more about my next project. 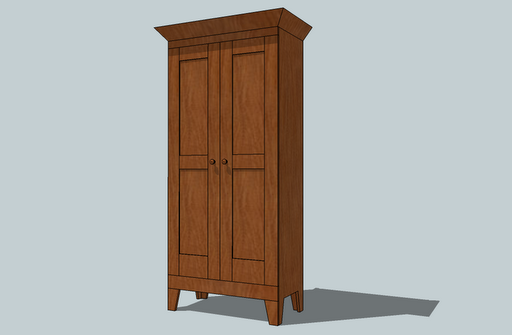 Right now, I envision making a Shaker inspired tall storage cabinet. It will house some of the junk that is often in the background of my project photos (example here). As a matter of a fact, I am considering devoting the balance of the year to upgrading my shop furniture: a new router table, a better place for my powered miter saw, and even some base cabinets for a secondary work area. I have a couple of books dedicated to Shaker furniture. 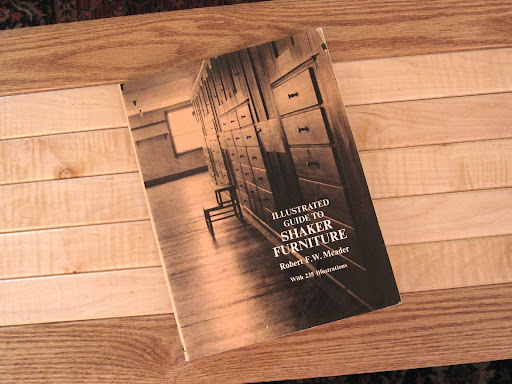 To help get some creative juices flowing I first turned to Illustrated Guide to Shaker Furniture by Robert F.W. Meader. It has 235 illustrations of Shaker furniture and a whole section devoted to case pieces. Some Shaker furniture is really cool and then some really isn’t (click the link – there are some nice photos to be seen). There wasn’t really anything in particular that was inspiring, so I decided to pull elements of some of the pieces that appealed to me in some way. Not what I want. The photo on the left is similar to what I envision. I don’t really care for the feet. Note the piece on the right – lots of panels on the doors and virtually no feet – unusual (click it to enlarge). A lot of shop furniture is very utilitarian in design which is to be expected really. I want shop furniture that has some style to it. But, in the photo above, the piece on the left is a little too much for me, especially the base design. The rest of it is sort of what I have been mulling over in my head. My first stab at a proper design. Note the simple cornice detail, large flat panel doors, and slab sides. 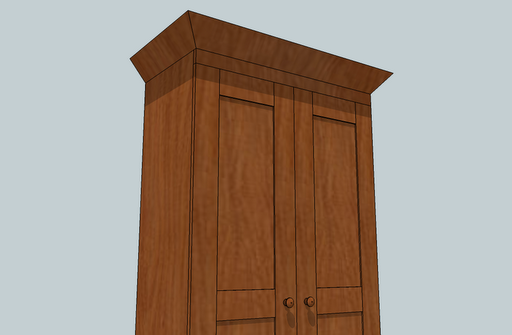 Hopefully, a simple design will help me execute more traditional methods of joinery. 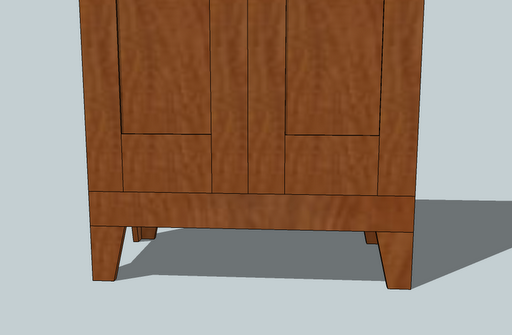 One of the goals with this project is to try my hand at more traditional joinery: true mortise and tenon joints instead of biscuits or pocket screws. 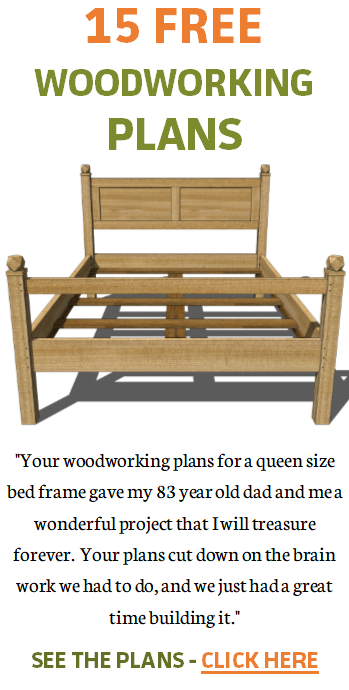 I may even try some hand cut dovetails for the case joinery – a first for me. An overall simple Shaker design will help me focus on more hand tool work. I’m diggin’ this. Note there is no traditional face frame – the doors mount directly to the sides. I can’t remember building a project like this without a full face frame. This design has a face frame found above and below the doors (with end grain visible from the sides), but the doors themselves mount directly to the slab sides. Without a face frame along the sides, the doors will swing open to reveal more of the items in storage. Awkward. 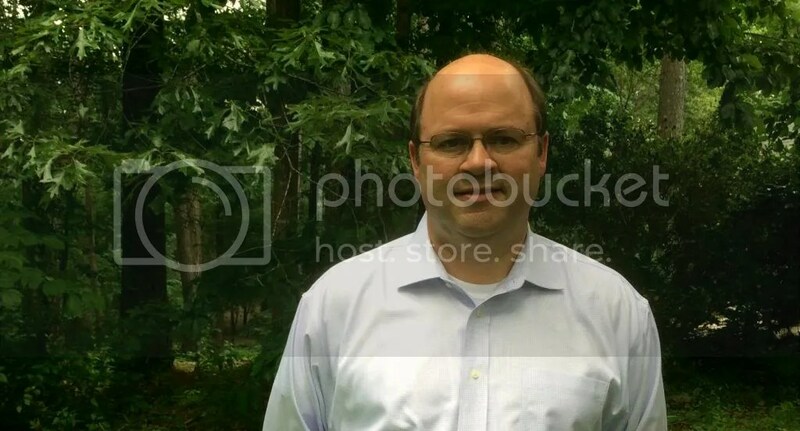 I dont’ know about this look. I am more comfortable with a base that extends beyond the front and sides. I am uncertain about the base. Most every case piece I have built has some sort of base molding and often bracket feet. The design above has feet, but the base is in line with the front and sides. There are examples in Meader’s book of pieces that have at least some molding detail at the base, but none that inspire me. It is also interesting how many different base styles are found on Shaker case pieces: some have bracket like feet, others with turned feet and some with no feet at all – the base simply sits on the floor. I have another design I am playing around with which could turn out to be what I end up building. The inspiration comes from my second Shaker book: How To Build Shaker Furniture by Thomas Moser. More on that later – comments on this design are welcome. Very cool. I love Shaker style for their simplicty of design and work. But then I also like Craftsman style as well. I am looking forward to seeing you post photos of the work.